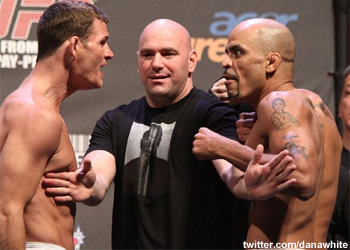 Michael Bisping has come under heavy fire since sharing his DNA with Jorge Rivera’s cornermen at UFC 127. Although the Brit has claimed all the livelong day he was spitting in their direction and not on anyone specifically, the heinous act has been deemed despicable, nonetheless. In an attempt to take up for their mate, Bisping’s Wolfslair team has issued a lengthy statement in their client’s defense. “I would like to give our take on what happened in Australia. Let me begin first by saying that in five years of competing in the UFC at every level, we have never encountered a more unprofessional outfit as Jorge Rivera’s camp. All the teams who rub shoulders regularly at all the events are always polite, respectful and courteous to each other. Regardless of any of the fighters smack talk or actions. all the camps will attest to this. Along comes this Phinney guy out of the blue, he is Rivera’s boxing coach and the guy who features heavily in the YouTube videos making fun of Mike Bisping. “These video’s were made with two purposes. One was to promote their tee shirt line ranger up and the second was to goad Mike into a brawl as this was their only chance of winning the fight. Okay well no problem so far, business is business and if that’s how they rely to win a fight then more power to them. The video’s poked fun at Mike in a personal way and to English people in general and had a huge amount of success. If you combine the numbers on YouTube over the four video’s I believe were in the half million bracket. That is phenomenal considering the campaign was over three weeks. So let’s be clear this wasn’t just banter going back and forth it was significant. Once again at this stage still no problem. It was adding hype to the fight. “The real problems begin in the hotel in Australia. As always fighters are staying in close proximity in the hotel for over a week and during the day the camps pass each other. Normally the fighters will be tense with their opponent but the teams always remain neutral and polite. Rivera’s crew were mocking mike and laughing at him and Jorge even gave an interview to Fanhouse saying if Mike was a man he would confront him in the hotel. “This situation was the reason for the emotional weigh-ins and throughout the catalyst was Phinney. In fact Rivera had two more coaches who never participated in any of this, they did act professional. It was always Rivera and Phinney. If you look at all the ranger up YouTube stuff it seems Phinney is the driving force behind the company and it was him even up to the point on the scale who was constantly goading Mike. I believe he should have concentrated more on real fight preparation like we did than silly childish games and behaviour. “This fight was not your normal fight, the hype was immense and I am sure the fans felt this. The illegal knee was what it was, Mike was over excited and timed it wrong. He is not known for illegal blows although this does happen in the sport from time to time. Whilst Rivera was recovering, Phinney was shouting obscenities to Mike if you look you can see Mike give him the finger in reply. He was also hurling abuse at our corner men, once again this behaviour is unheard of in the UFC. Anyway YouTube videos and goading Mike did him no good and Mike dispatched him with ease. “Mike was still emotional and asked Rivera for an apology, still Phinney was shouting abuse and Mike replied to him, Mike did spit but on the floor in his direction not on him. Phinney was hurling abuse at Mike and our corner men the whole time. His behaviour at the cage was disgusting and unbefitting of the UFC and I won’t go into any more detail as Phinney doesn’t deserve any notoriety. He does not reflect in anyway the normal conduct of us and the rest of the teams. If that’s how he has behaved at other events then he needs to go back to them. Although I believe that after this we won’t be hearing much of Mr Phinney anymore.